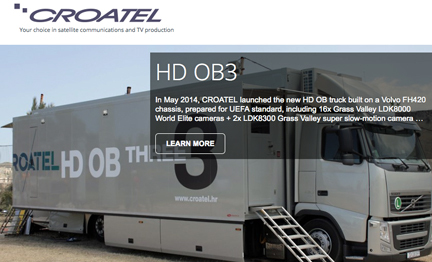 [SatNews] CROATEL, a broadcast production and satellite services company in Zagreb, Croatia, has expanded its outside broadcast (OB) fleet to include a third van complete with high-definition (HD) cameras, switchers, routers and other live production solutions from Grass Valley, a Belden Brand. Called HD OB 3, the van will transmit coverage of UEFA Champions League, UEFA Europa Football League, Croatian Football League, athletics and other international sports events. Kapetanovic Sistemi, a longtime reseller of Grass Valley solutions, was instrumental in bringing together the right equipment and expertise to help CROATEL deliver world-class live production with HD OB 3. At the center of HD OB 3’s nonlinear production workflow is Grass Valley’s 3 ME Karrera Video Production Center switcher with control panel and compact K-Frame video processing engine. The software-based Karrera with K-Frame platform is built on a modular approach, making it easy for CROATEL to make future updates to support the demands of new applications. 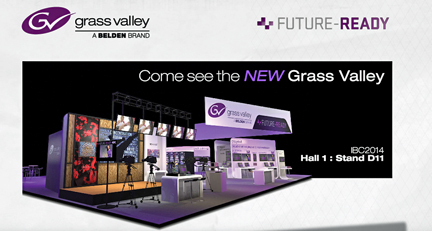 CROATEL purchased five additional Grass Valley LDK 8000 Elite cameras, making 20 camera units available for the HD OB 3. The vehicle is also equipped with a Densité modular system that includes six 3RU Densité 3 frames for signal processing and distribution, a Kaleido- Modular-X multiviewer, an NVISION 8140 HYBRID router with two NV920 controllers and additional compact routing equipment, two HD/SD master sync generators and a master sync changeover unit.